This is a site for people who want to improve their knowledge of equipment and modelling technique and who would like to join a club of like minded people within the Milton Keynes, South Northants and North West Bedfordshire area. 38 High Street, Olney. MK46 4BB. £6.00 for a Family, 2 adults plus 2 children. Refreshments were available at a very reasonable cost, as was the full Bar Menu. Doors opened between 10.30am and 4.30pm. There was free parking in the Town, within walking distance. 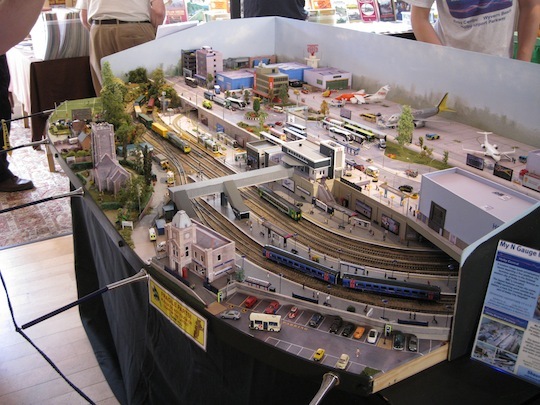 This extensive DCC layout is currently under construction and was exhibited to illustrate the considerable progress that had been made since last year. This is a long term project and with the Club meeting on a one evening a week basis, it is recognised that the project will take a number of years to complete. Ian's Trains - Ian Carter unfortunatly withdrew at the last minute. RCTS (Rail and Correspondence Travel Society) - Bob Ballard, Milton Keynes Branch. 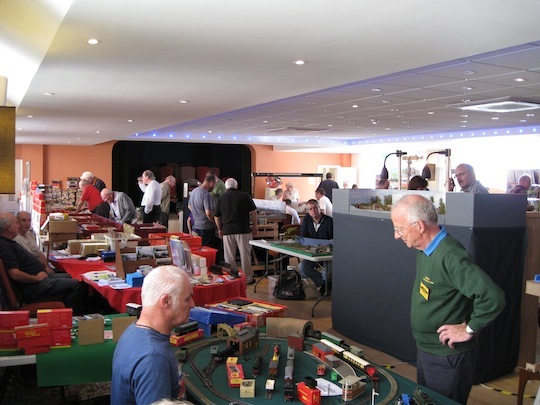 LCGB (Locomotive Club of Great Britain) - Peter Crossman Bedford Branch. Special Joint Stall - Railways & Revolution. Britain's Industrial Revolution: the Making of a Manufacturing People 1700-1870, written in Olney by OMRC member Barrie Trinder, and published by Carnegie, extends to 688 large pages, has 640 illustrations, and describes in detail the evolution of railways. The author was on hand to sign copies purchased at the stall. Steve Duckworth, a professional locomotive builder, based in Sheffield presented some Somerset & Dorset Joint Railway Locomotives: modelling the pre-Grouping period in P4, showing how proprietary, kit and scratch-built models have been customised for his project to model the S&DJR as it was in 1922. The exhibition went well despite one of the traders withdrawing at short notice. 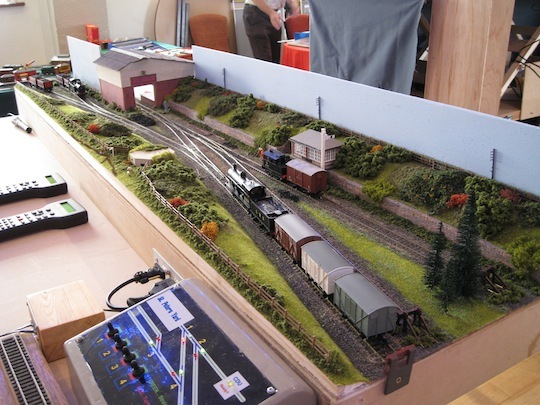 Jack and Mike filled the breach, bringing along a Hornby Dublo 3 - rail layout combined with a Triang layout, both dating back to the early 1960's and late 1950's. The exhibits this year were excellent and we had visitor numbers almost as high as last years record. We have already started to plan next years event, to be held on Saturday 13 September 2014, again at The Carlton House Club. Below are some photographs of the exhibition, to give a flavour of the day, with thanks to Chris. Holby Airport Parkway in N gauge. 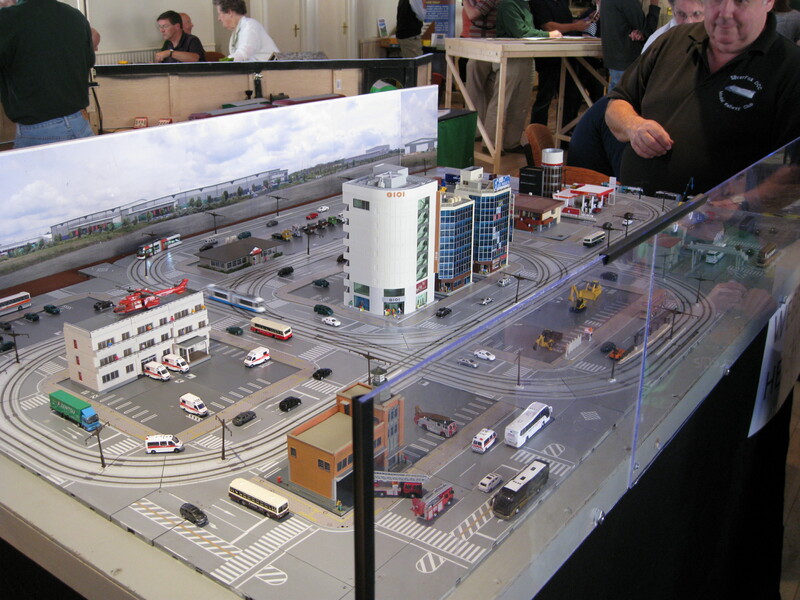 General view of the exhibition featuring the Hornby Dublo and Triang layout. The map below gives an indication of the location of the Carlton House Club within the postcode spread. It is on the East side of the road, next to the United Reform Church. This page was last updated on 14 January 2014. 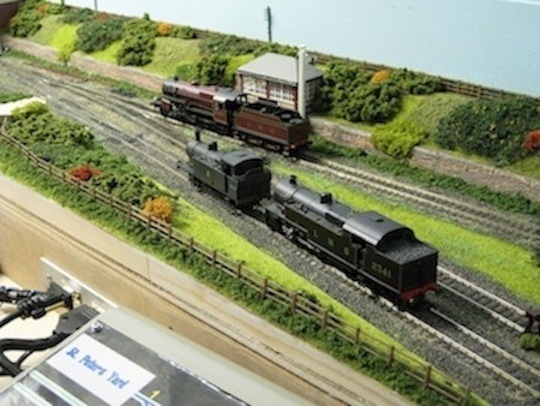 © Olney Model Railway Club 2019. All rights reserved.